Yesterday’s sandwich was so good we repeated it, particularly since we still had half an apple! Our Meatless Monday choice this time was Cauliflower Cheddar Soup because it is definitely soup weather! The soup makes six serves. We dropped the potatoes, which would have added body, so we compensated by using less stock. Served with a hot panini roll it was great. The panini roll was 63c. A really good soup for $2.27 per serve plus the roll, or $2.90 per serve. Back in our own home and own kitchen we defaulted back to toasted sandwiches. Today’s combination added apple slices between the sliced Turkey breast and sliced Swiss, for a little crisp sweetness. It worked perfectly. The Foodies were in Azusa so that Foodie Philip could participate in a Showcase hosted by his vocal coach. Between rehearsal, video setup and the performance we walked up to Sushi Ara where we’ve eaten before. We had a generous serve of sushi and sashimi for $22.70 with tax and tip. After a very early breakfast on the plane, we had a slightly early lunch of meat pies we had carried back from Australia. Starting as frozen, by our lunch time they were ready for a reheat in the oven. The pies were Au$3.00 (US$2.10) each, pretty tasty, and the perfect thing for a dark Winter day after three weeks of sunny Summer! As we were both still a little tired from the flight, we opted for our simple go-to meal of Vegetable Gyoza and Ginger Miso Broth. Foodie Philip had two eggs to add some protein, but Foodie Greg had just the gyoza and soup. The Foodies were up before the summer sun to catch a train to Sydney and on to a flight home. Because of the flight we had a ham and cheese baguette at Sydney airport for Au$13.00 (US$9.10) each as a brunch. Shortly after taking off in the middle of the Australian day, we were served our evening meal on Los Angeles time. Both Foodies chose the Lamb Casserole, which was pretty good, accompanied by some quite boring white rice and the dullest steamed vegetables possible. Savored with the lamb it wasn’t too bad, particularly for airline food served in the sky. The meal was included in the flight. For lunch Foodie Greg’s parents treated us to lunch at nearby Belmont 16′ Sailing Club where Foodie Greg enjoyed his Fish and Chips while Foodie Philip enjoyed a Rump Steak (Sirloin) with Buttery Mashed Potato and roasted cherry tomatoes. Again the Foodies were hosted, this time by long term friends in their house where we enjoyed shrimp and/or traditional bruschetta, followed by lamb, roasted sweet potato and a rather enjoyable garden salad. Much champagne and wine flowed and a good time was had by all. For lunch we finished the chicken breast and broccoli slaw on sandwiches. The broccoli slaw was Au$1.25 per serve. A good sandwich for Au$2.75 (US$1.93) per serve. Tonight we had Foodie Philip’s family over for dinner. 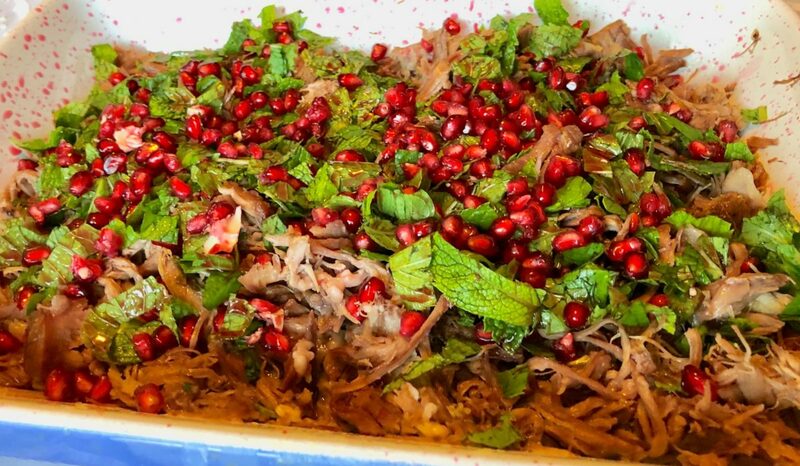 We prepared Nigella Lawson’s braised lamb shoulder with mint and pomegranate served with a homemade Greek Salad. Danish feta was Au$3.03 or 43c per serve. An excellent meal all round, and enjoyed by all. The addition of the pomegranate juice was welcome. A fitting end to our trip for Au$6.34 (US$4.44) per serve. For lunch today we returned to Mr Schnitzel in Warner’s Bay for an enormous Chicken Schnitzel Wrap with lettuce, bacon, parmesan and a Caesar dressing. It’s no surprise that the shop is full of those expending a lot of energy in their daily work. A very, very filling meal with over 300g (12oz) of Schnitzel alone, for Au$13.00 (US$9.10) per serve. Tonight Foodie Greg cooked for his parents, we believe for the first time! He decided on lamb loin chops with an eggplant, feta and pomegranate salad. The eggplant was first tossed in olive oil and balsamic vinegar before being roasted and allowed to cool to room temperature before being added to the salad. Mint was $3.00 but we only used about ¼ or 19c per serve. 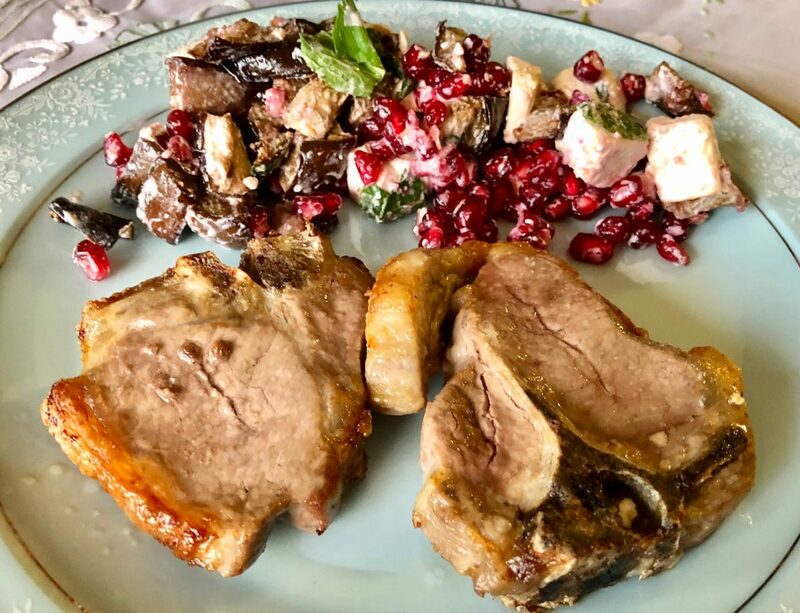 The lamb chops were complete with ‘tail’ which brings extra flavor from the fat, while the ssalad had a great roasted flavor from the eggplant that was nicely balanced with the creamy saltiness of the feta and tart freshness of the eggpant. A very successful meal for Au$7.78 (US$5.45) per serve. As we had not got to the shops, we had toast and butter for lunch for under $1.00 per serve. Having got to the supermarket we had a Roast Chicken Leg each served with broccoli slaw kit. The broccoli slaw kit was Au$5.00 or $1.25 per serve. 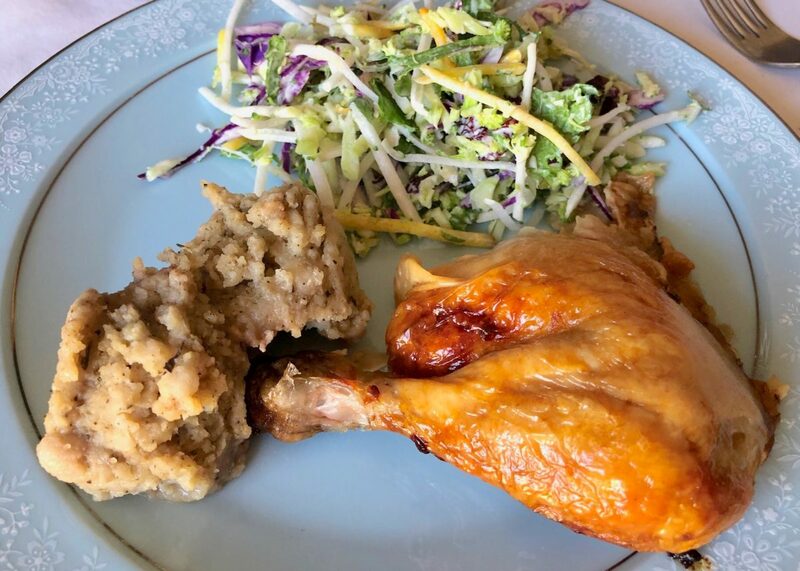 While it was hardly the most exciting meal of recent times, the chicken was well cooked and the slaw provided a slightly tart, tasty crunch. Foodie Philip finished the somewhat boring stuffing (dressing). An okay meal for Au$4.25 (US$2.98) per serve. Today was a travel day, so we grabbed a corner beef, tomato and cheese sandwich at Sydney Airport for Au$8.50 (US5.95), which is pretty expensive. For dinner, we were invited to Foodie Philip’s brother’s home for family dinner, where he generously hosted with fillet steak, garden salad a a great homemade fried rice that was rich in bacon and flavor. 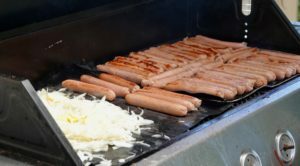 Our final reunion activity was at the home of a Cousin in Devonport where we had an Australian style BBQ, which would be considered a grill in the USA. A fast grill, but always with at least part of the cooking surface dedicated to a solid metal cooking surface – for the grilled onion, if nothing more. There were at least two batches of onions, and a lot of rissoles. 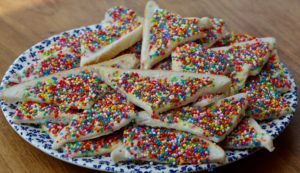 It was a little throwback, including childhood classics like Fairy Bread, which was not as popular with today’s children as it was with their parents. Once again, local family hosted with salads and deserts. As we were quite late back from the reunion and a side visit with some family members, we stopped at the Beach Hotel in Burnie for dinner. Foodie Greg had the Souvlaki Wrap, while Foodie Philip was not yet tired of scallops, so he enjoyed them a new way: garlic cream sauce. 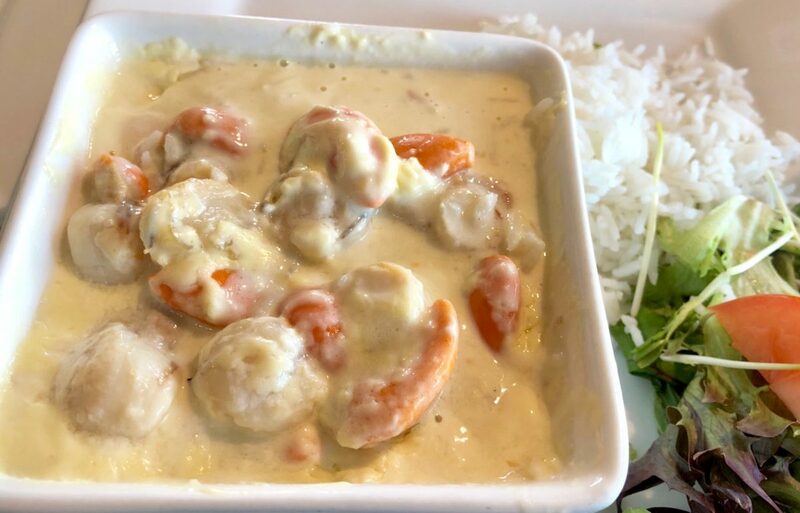 We thought both meals were good examples of what they were, for Au$21.55 (US$15.09) per serve.